Sea ice provides a resting and birthing place for seals and walrus, a hunting and breeding ground for polar bears, and a foraging ground for arctic fox, whales, caribou, and other mammals. A lack of ice and poor ice conditions cause stress for marine mammals and ultimately affect their livelihoods and abilities to reproduce. According to the Arctic Climate Impact Assessment's 2004 report, Impacts of a Warming Arctic, expected reductions in sea ice will drastically shrink marine habitats for ice-dependent seals, polar bears, and some seabirds, likely pushing some species to extinction. Poor ice conditions affect polar mammals in a variety of ways. If the pack ice retreats beyond the edge of the continental shelf where walrus typically feed, they must swim great distances to reach their feeding grounds. 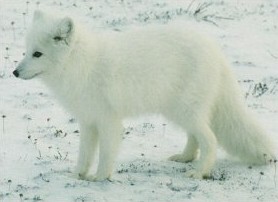 Similarly, Arctic fox have been stranded on shore with land predators, instead of being able to migrate onto the ice. 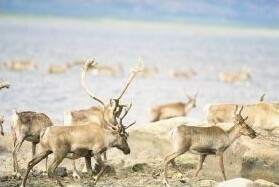 Peary caribou have been observed falling through unusually thin ice during their migrations. Narwhals are a species of whale that migrate closer to coasts in summer. When the winter freeze begins, they move away from the shores and live below densely packed ice, surviving by breathing through leads and small holes in the ice. As spring comes, these leads open up into channels, and the whales return to coastal bays. Decreasing sea ice compromises the livelihood of most marine mammals, but in the case of narwhals, increasing ice is the problem. One area with increasing sea ice is Baffin Bay, between Canada and Greenland, where ice cover increased an average of 0.04% per year between 1978 and 2001. This small increase is enough to close holes in the ice where narwhals feed, and they also risk being trapped in the ice. Seals and polar bears are greatly affected by changes in sea ice, as the following sections explain.